NETWORK FINALS: The NCIS season finale went up another 0.1 in final numbers, as did CHICAGO FIRE. CABLE HIGHLIGHTS: Basketball was at the center of Tuesday cable, with both leading telecasts on ESPN: Game 1 of the Cleveland vs. Toronto NBA PLAYOFFS at 2.30, and coverage of the NBA DRAFT LOTTERY at 1.20. On Discovery, THE DEADLIEST CATCH gained 0.02 to 0.71, and THE LAST ALASKANS fell 0.05 to 0.36. 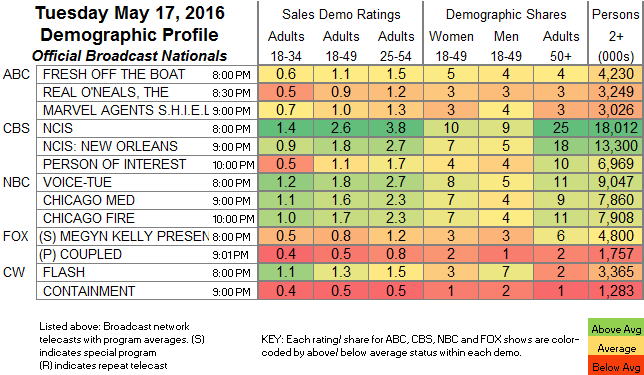 On USA, CHRISLEY KNOWS BEST was down 0.04 to 0.62, and FIRST IMPRESSIONS slipped 0.03 to 0.27. OWN’s IF LOVING YOU IS WRONG shed 0.03 to 0.61. On Spike, INK MASTER edged up 0.02 to 0.57, and the REDEMPTION after-show was down 0.02 to 0.30. E!’s BOTCHED returned at 0.44. NBC Sports Net’s NHL PLAYOFFS game was at 0.42. On History, TOP GEAR rose 0.02 to 0.41, and CAR HUNTERS was at 0.19/0.18, compared to last week’s 0.23/0.21. Food Network’s CHOPPED JR gained 0.04 to 0.40, and CHOPPED fell 0.03 to 0.32. On Bravo, BELOW DECK shot up by 0.13 to 0.37, while TOUR GROUP was steady at 0.09. TLC’s LITTLE PEOPLE BIG WORLD ticked up to 0.35, and OUTDAUGHTERED lost 0.04 to 0.25. On MTV, AWKWARD gained 0.03 to 0.33, and the series finale of FAKING IT lost a tick to 0.19. Oxygen’s BAD GIRLS CLUB was down 0.02 to 0.32. HGTV’s GOOD BONES held at 0.30. On A&E, STORAGE WARS was at 0.30/0.27, compared to last week’s pair of 0.27s. A Lifetime DANCE MOMS special was at 0.29. 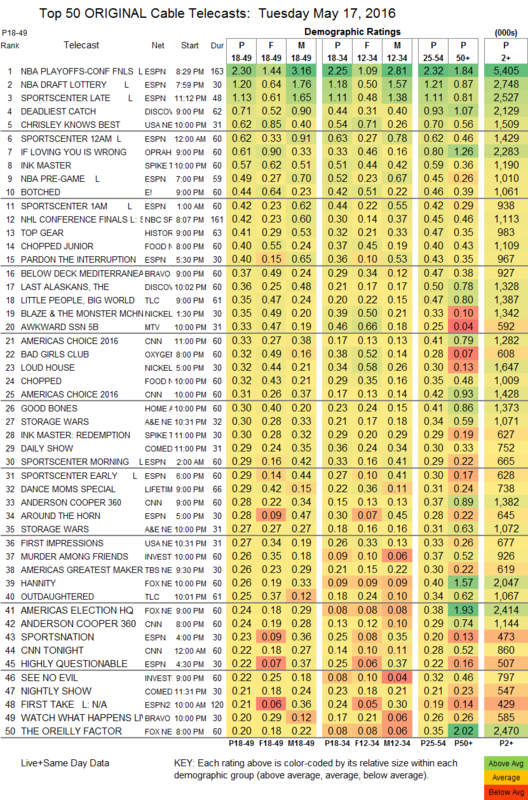 On TBS, AMERICA’S GREATEST MAKERS was steady at 0.26, and SEPARATION ANXIETY ticked down to 0.16. BET’s CHASING DESTINY was down 0.02 to 0.17. Freeform’s STITCHERS remained at 0.15. AMC’s THE NIGHT MANAGER rose 0.02 to 0.14. POP’s IMPACT WRESTLING held at 0.08.